This month I watched M. Butterfly, which is the only film directed by David Cronenberg that I had yet to see. René Gallimard (Jeremy Irons) is a French diplomat stationed in Beijing, China during the 1960s. René meets and falls in love with Chinese opera singer Song Liling (John Lone). The affair lasts for many years, with René seemingly unaware of Song’s true nature. Even after 24 years, M. Butterfly stands out among the films in David Cronenberg’s filmography. At the time, Cronenberg was still primarily known for his body horror films, so a period romance was a little bit out of left field for the director, who apparently sought out to direct this film after enjoying the original play that it is based on. In fact, this is the only one of Cronenberg’s films that isn’t at least partially considered a Canadian production. M. Butterfly came two years after David Cronenberg’s adaptation of William S. Burroughs’ Naked Lunch and it can be said that this film continues the homosexual themes Cronenberg explored in that film. The film also marks the filmmaker’s second collaboration with Jeremy Irons, following their work together on 1988’s Dead Ringers. At this point, it is probably no secret that the big reveal in the film is that René Gallimard’s love interest Song Liling is really a male communist spy. However, unlike the similar reveal a year previous in Neil Jordan’s The Crying Game (another blindspot of mine), David Cronenberg opted to not really be coy with Song’s true nature, by giving actor John Lone top billing alongside Jeremy Irons. However, even knowing that Song Liling is a male beforehand still makes M. Butterfly an interesting film to watch, since the question throughout the story is whether René Gallimard knew that Song Liling was a man and just loved her nonetheless. Also, watching the film in a modern context, there is enough in the story to suggest that Song Liling was actually a transsexual woman and she was always her true self when with René. 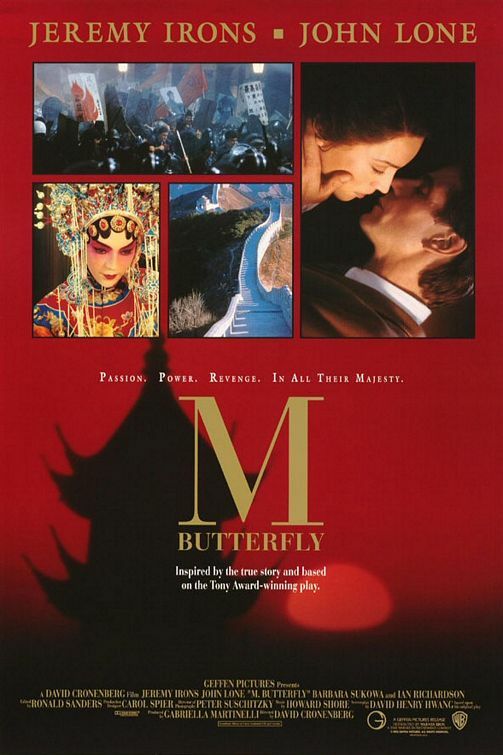 Overall, it can be said that M. Butterfly is a film that began to show David Cronenberg’s range as a filmmaker, which would lead to his later films like A History of Violence, Eastern Promises, and A Dangerous Method. Blindspot 2018: Cult Films of the 1950s to 1970s: Attack of the Killer Tomatoes!